This is a review for a supplement called Altrum Memory Focus. The manufacturer claims that this supplement will support thinking power, memory and mental focus. Read on to learn more about this product and whether or not it is the ideal choice for you. Chinese Skullcap Root Extract – Works to sustain the brain’s youthful cells. Acacia Heartwood and Bark Extract – Works to promote focus, faster thinking and attention. Astaxanthin Complex – Works to support nutrient supply, energy production in the brain and oxygen flow. Alpha-Lipoic Acid – Works to preserve brain cells following trauma. Acetyl-L-Carnitine – Works to support neurotransmitters that help you to stay sharp and clear and increase learning capacity and short-term memory. Blueberry Fruit Powder – Works to maintain the brain’s youthfulness. Please note: The capsules are made of gelatin, so this product may not be vegan or vegetarian. It is recommended that three to six capsules be taken every day with or without food. It was noted that the supplement may work better if it is taken between meals, as it is better absorbed then. There were no possible side effects listed on the manufacturer’s website. It was noted that those undergoing medical treatment or taking prescription drugs should consult a doctor prior to taking this supplement. Those who are pregnant or nursing should not take this supplement. This product costs $42.30 for a bottle. If you are a member, the price is $29.75 for a bottle. Each bottle contains 100 capsules, which is a 30-day supply. The manufacturer does not appear to offer a guarantee with the purchase of this product. This may be a concern for some who may not want to risk purchasing a product when they may not be able to get a refund for if they are not satisfied. The website does not feature any customer reviews or testimonials, which may lead some to believe that this product does not work. Altrum Memory Focus is said to support thinking power, memory and mental focus. It is unclear as to whether or not this product has worked for customers who purchased it because there is a lack of customer reviews and testimonials on the manufacturer’s website. The price for the supplement is affordable for most and the manufacturer offers a great deal for those who become members. The price may be affordable, but there is no guarantee for the product, so there is a risk when purchasing it. Customers may want to purchase a product that they can return if they are not satisfied, but the manufacturer may not accept returns. 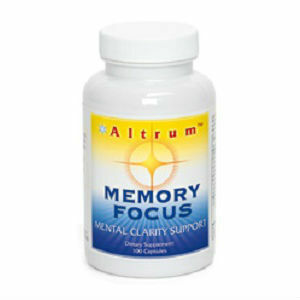 Overall, Altrum Memory Focus seems like a good product and it may work for you depending on what you are looking for. Henry Costa	reviewed Altrum Memory Focus	on June 15th	 and gave it a rating of 2.5.